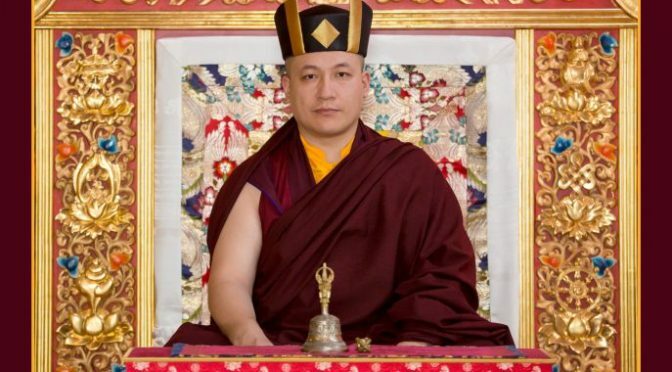 Thaye Dorje His Holiness the 17th Gyalwa Karmapa, shares the following message on the fourth anniversary of His Holiness 14th Kunzig Shamar Rinpoche’s parinirvana. June 11th 2018 marks four years since the passing in this life of my late teacher, fellow lineage holder, and personal spiritual father, His Holiness 14th Kunzig Shamar Rinpoche. Shamar Rinpoche’s tireless efforts to preserve our precious lineage are a great example for all of us. May we honour his example by continuing to practice the Buddha dharma, and share a message of peace for all sentient beings. On the anniversary of Shamar Rinpoche’s parinirvana, may we all continue to pray enthusiastically for our great teacher’s swift return.